One-for-one replacement for sugar in ALL food applications. Whey Low® is perfect for baking. Cakes and cookies cannot tell the difference, and neither will you. Whether you are a Low-Calorie, Smart-Carb, or Low-Carb Dieter, a Type 1 or Type 2 Diabetic, or simply Health-Conscious, Whey Low® is the choice for you. So what's taking you so long? Your taste buds are waiting. How does Whey Low® compare to Splenda®? Whey Low® is all-natural. Splenda® is partly artificial. Whey Low® is a patented blend of natural sugars. Splenda® contains a chlorinated organic chemical. Whey Low® tastes exactly like sugar...Guaranteed. Splenda® does not back such a guarantee. Whey Low® is perfect for baking, just like sugar. Splenda® requires special recipes for baking. Whey Low® Granular has 5 Calories per 5 gram tsp. Splenda® Sugar Blend for Baking has 20 Calories per 5 gram tsp. Whey Low® replaces sugar one-for-one. Splenda® Sugar Blend replaces sugar one-for-two. For more information, search Google® for "Whey Low" testimonials and Splenda testimonials. achieve & maintain a healthy & attractive body image. Caloric value of 1 Calorie/gram (table sugar = 4 Calories/gram) supports low-calorie diets. Effective carbohydrate content (or net impact carbohydrates) of 1 gram/teaspoon supports low-carbohydrate diets. 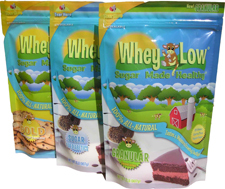 Natural sugars in Whey Low® inhibit absorption of dietary carbohydrates such as starch and sucrose. deal you can't pass up.